Congratulations on your pregnancy! Pregnancy dressing is fun, but also a little frustrating. Like many things during pregnancy, finding something to wear can be tricky, as the bump changes and grows and your body changes along with it! I wanted to put together a little page with some of my maternity outfits and resources that might help you, or someone you know who is pregnant. The BEST resource is my eBook, How to Have a Stylish Pregnancy On a Budget! I also have some helpful posts on the blog which I've included below. My wardrobe goals during pregnancy were to buy as little maternity clothing as possible, and to make use of what I already owned for as long as I could. 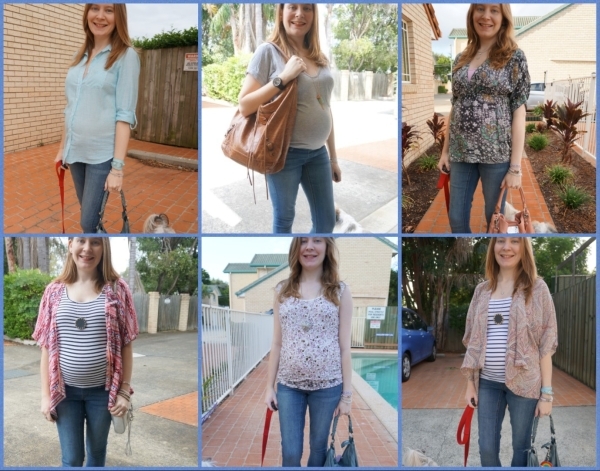 I managed to make it to 40+ weeks with a mix of a few maternity pieces and utilising my regular wardrobe. I was pregnant over summer, autumn and winter, and had to find professional office outfits as well as easy go-to outfits for the weekends. You can read more about my maternity dressing and some of my tips and advice in the "Pregnancy Wardrobe Essentials" post series, and see some of my favourite pregnancy outfits. 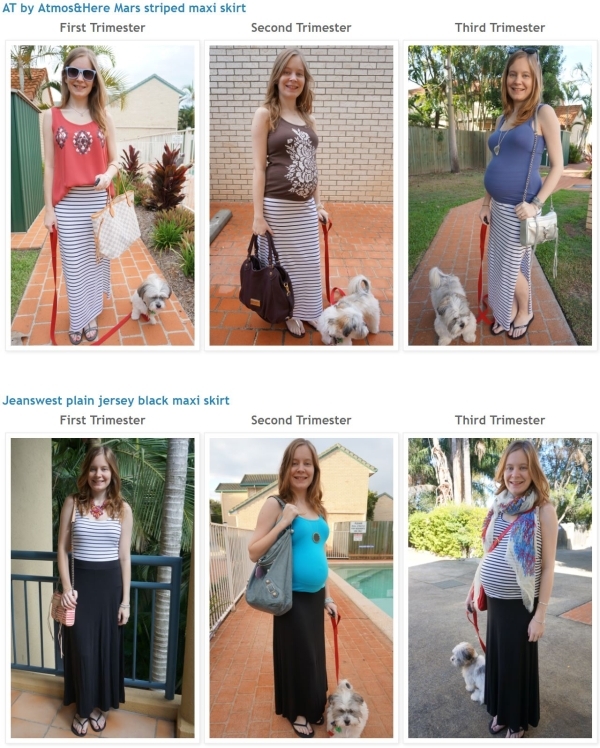 If you're looking for more pregnancy outfit inspiration, you can view my second trimester outfits and my third trimester outfits. The most important factor for pregnancy dressing is comfort, but it's nice to get some inspiration or ideas for different things to try as the wardrobe options can get really limited towards the end! 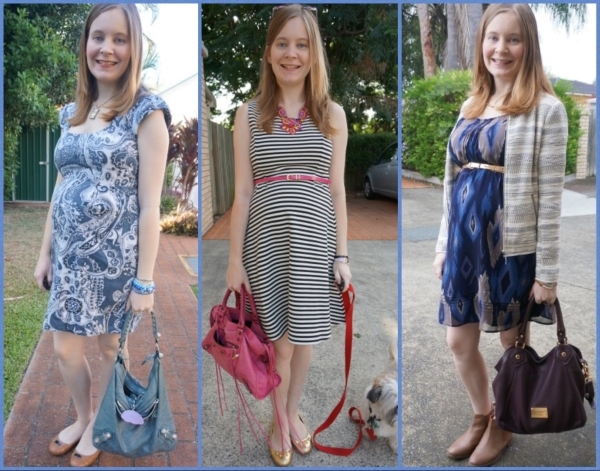 If you're coming to the end of your pregnancy, you can get some postpartum style ideas from the blog archives too! Thank you for this post and the links to others in the post!! This is going to help me a lot!! !You are the Best!! Love your pictures from each week! I didn't take photos like this during my pregnancy - everyone said I would regret not having photos... didn't believe them at the time, but guess what - they were right! If we have a second child I will definitely take photos. And I'll take fashion inspiration from your shots here! Aww you look so radiant Mica, I love your bump! I think it's so easy to look frumpy with pregnancy weight but I absolutely adore your styling and this will be great inspiration for other expectant mothers. You look beautiful.